A co-worker of mine suggested to me that Sunday would be a good day to visit Trainworks at Thirlmere, as the venerable 4001 would be leading the loop line trains between Thirlmere and Buxton, rather than the more commonplace 2705 (that’s right, we specifically chose a day to visit a train museum when there would be NO operational steam engines to be seen). This was the annual Diesel Day, a celebration of vintage diesel motive power, often underappreciated in the world of preservation, as even historic diesel engines lack the crowd drawing power of steam. Thanks to a friendly SSR driver, we had learned that B61 would be departing Parkes Yard pre-dawn with a southbound loaded railset (loaded at Bathurst the day prior). Sure enough, when we arrived on a very cold Parkes Station a little after 0500, we found B61 idling away at the head of its train. Their departure would be delayed by L270, 48157 and 48152 (those locomotives sound familiar?) shunting grain wagons within Parkes Yard. We were more than happy to snap plenty of photos of both L270 and B61. As L270 was shunting, it was almost impossible to get a “normal” shot of the locomotive in the rather pleasing station and yard lighting. In fact, it was only as we were getting in the car to go for a coffee that Todd remarked “oh look, it’s parked next to B61”. I grunted something in reply, conveying the message that the “stupid thing” would likely end up moving as soon as I set up the tripod again. When he went on to mention that the crew had climbed out and walked off, he finished the statement to a dust-cloud outline, as I was already back on the platform setting up. Shot taken, I returned to the car with a rather bemused expression on my face. The first success of the day and the sun wasn’t even up yet! All of the “real” photographers would likely still be in the warmth of their beds – everyone knows that if you can’t get a 3/4 sunny shot, it’s not worth leaving the house for! 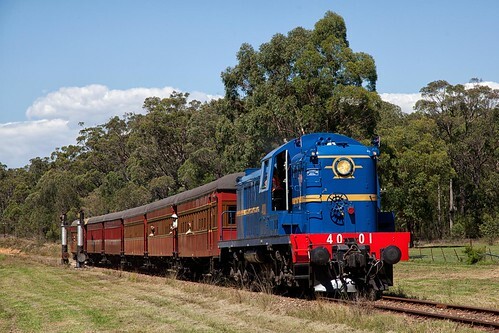 The Sydney Great Train Weekend is held on the Queens Birthday long weekend. 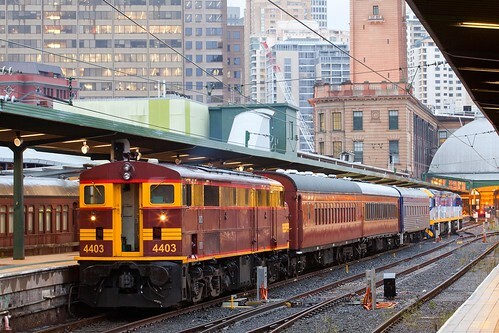 The New South Wales Rail Transport Museum (NSWRTM) bring a number of heritage exhibits from Thirlmere to Sydney’s Central Station, where they are put on display for the general public to enjoy. The Powerhouse Museum provides steam locomotive 3265 for the display, which spends the weekend in light steam alongside the platform for people to climb into the cab and see a real, live steam locomotive. 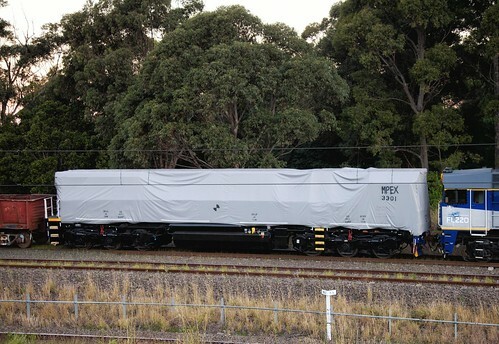 In a similar vein, 4001 and 4490 are at the other end of the platform, to allow people to examine the first mainline diesel locomotive in NSW. 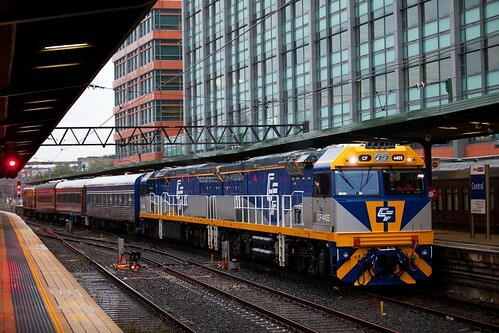 As well as the heritage items, RailCorp provides a CountryLink Xplorer and XPT set for people to inspect. 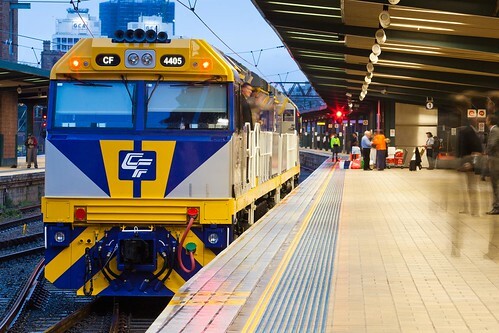 As has been mentioned in previous years, this is an excellent opportunity to show people the new Waratah train, although this opportunity has never been capitalised on. 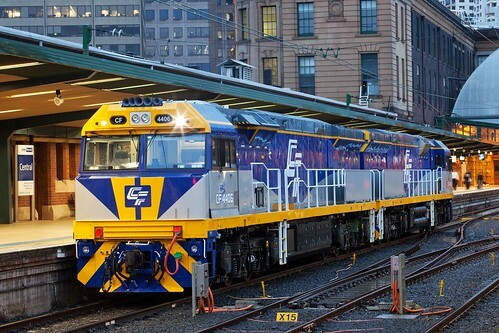 June 2012 is already shaping up to be an interesting month – firstly the Premier of NSW announces a day return service between Bathurst and Sydney, CFCLA recommissions lease unit 44209 on a series of corporate trains and Qube announces a takeover of Independent Railways of Australia. 44209 was previously painted in the R&H Transport scheme of red and white. The unit had seen service with Patrick Portlink, P&O Trans Australia and El Zorro in the twelve months before it’s withdrawl. 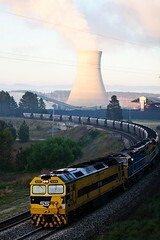 The unit suffered a seized traction motor while in use on El Zorro Victorian grain trains in late 2011, and was eventually towed to Goulburn for repair work. 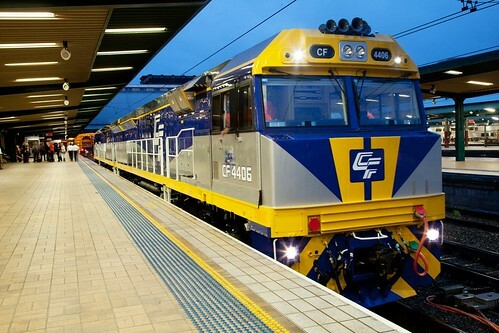 While at Goulburn, the locomotive was repainted into the CFCLA livery, although it remained on transfer bogies while work was undertaken to the traction motors. One can only wonder if it will join stable-mate 44208 on hire to Qube, or if the unit will return to El Zorro (or perhaps another operator entirely). For more photos of the CFCLA charter, click here. 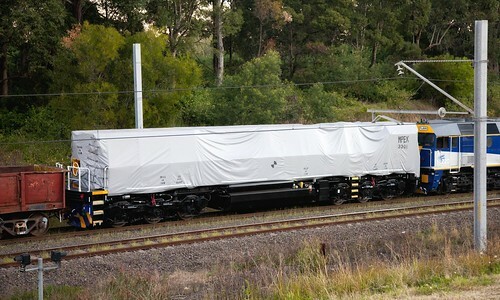 Qube Logistics also announced the takeover of Macarthur Intermodal Shipping Terminal Pty Ltd (MIST), which owns and operates Independent Railways of Australia (IRA) for container trains between Minto (where the MIST freight terminal is located) and Cooks River/Port Botany, as well as regional rail services between Cooks River and Narrabri, Dubbo and Bathurst. This is potentially damning news for IRA’s fleet of 44 Class locomotives, most of which are out of service at any given time due to mechanical problems, brought on by their age and a lack of appropriate spare parts. This news is also potentially worrying for fans of the operators imported Danish “MZIII” 14 Class locomotives, which have also been plagued with failures in recent months. It may be that Qube (who operate their own 44 Class, ex CFCLA rental units 4471 and 4477) use IRA’s 44 Class as a source of spare parts, and set aside the 14 Class indefinitely. 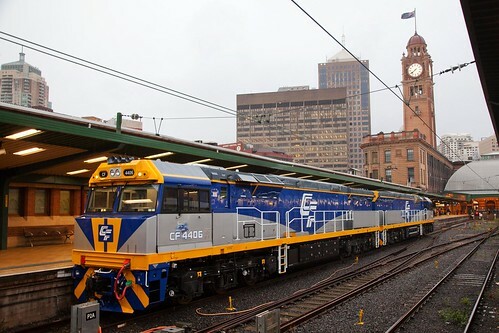 CFCL Australia ran a special train on Thursday, February 2nd to celebrate the delivery of their new CF Class locomotives from Broadmeadow to Sydney Terminal, hauled by CF4405 “Beldale Ball” and CF4406 “Kiwi”. The class are of the General Electric C44aci model, capable of producing over 4000hp. Similar to a long line of locomotives before them (92 Class, 6000 Class, XRN Class and the CEY Class), the locomotives have been manufactured by UGL (formerly United Goninan), and are destined for lease service (initially) with Pacific National. 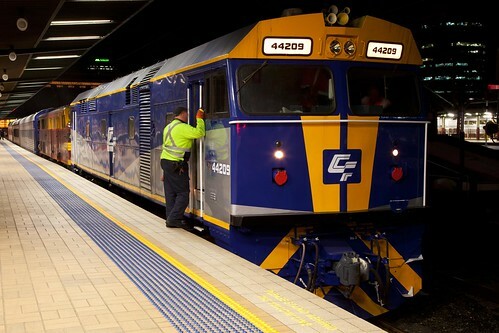 To celebrate their delivery, CFCL Australia arranged a special train for their staff, comprising two privately owned carriages from Canberra, and their own crew car (CDAY 1x). 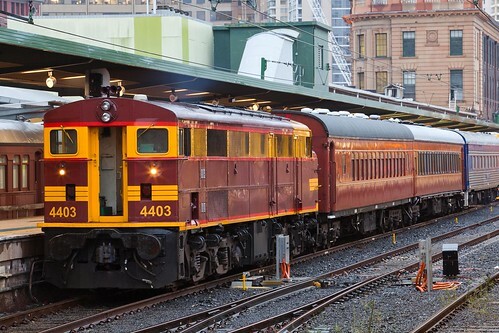 The train was hauled from Sydney to Broadmeadow by ARHS ACT owned 4403, where the two CF Class were attached for the run down to Sydney. 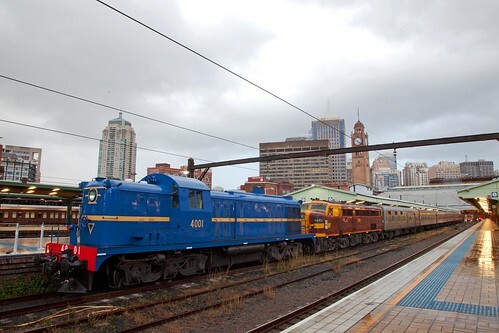 Upon arriving at Sydney Terminal, the two CF Class were cut off from the train to await their path north to return to Broadmeadow, while 4403 departed southbound with the cars. The CF’s remained on the platform for approximatly forty minutes, allowing plenty of time for official (and unofficial) photographs to be taken. Although it was a bit of a juggle getting home from work to change and grab the camera and tripod, it was worth the effort. The first two photos were handheld, but due to the rapidly diminishing light and the ever present rain, I decided to avoid using high ISO settings and just deal with the tripod. Shooting mostly at f13, the results were certainly worth the effort, I feel. As usual, click on the photos to view them on Flickr, where they can be viewed at a larger size. I am certainly looking forward to photographing these handsome beasts in lease service, even if it is just on coal traffic! 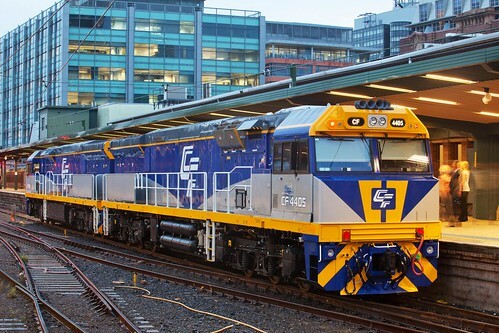 I imagine, should they prove successful, CFCLA will have little hesitation to order more, as they will no doubt be in high demand by companies looking for modern motive power without investing the initial capital! Regular travelling companion Todd Milton and I decided to pay our first visit to the Parkes area in November, with the hope of seeing something a little different from our usual haunt, the Main South. A regular diet of NR and 81 Class will do that! The checklist of “things to see” included the two shunting units at Manildra, the various Manildra feeder grain services (typically the domain of 48 and X Class locomotives), as well as any branchline grain trains we could lay out hands on. 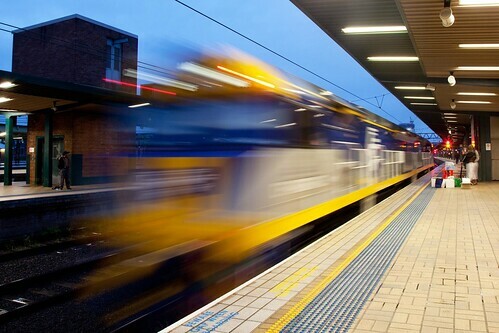 Finally, a shot of The Parkes – Perth SCT service was a must-have. According to plan, AR02 loaded coal from Airly was the first train to pass our vantage point at 0618 behind G513, C508 and C503. Next to arrive was 1865N freight, bound for Kelso (Bathurst) behind GL107 and GL101. 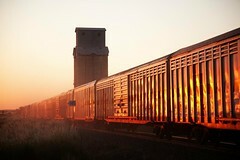 We then hopped onto the highway to move to Sodwalls, for a spectacular dawn lit shot as the train passed around the well-known horseshoe. That is, we would have, if we’d not made the mistake of continuing on to Brewongle, with word that 1865N was stopped at Wallerawang. We assumed we could get a shot of the up Indian Pacific at Brewongle, before moving to Raglan to get the GL’s climbing the steep grade into the station. Imagine our surprise when GL107 snuck up on us (prior to this, I didn’t realise a GL could sneak up on anyone), crossing the up Indian Pacific at the former station site. Still, a fine shot of NR27 was gained on the s-curve at Brewongle, before we moved to Kelso to see the freight shunt into the siding. With no other trains in the area until the afternoon, we decided to head west to Manildra. We’d been told that an 81/X combo was to depart Parkes Sub-Terminal at lunchtime, bound for Enfield, and we figured upon getting there early to find a decent spot for a shot! Passing through the township of Manildra, we reflected on the fact that the mill is not so much a feature of the town, it appears that the town is a feature of the mill! The huge silos and milling buildings dwarf the surrounding town, and entirely encircle the former station site, which is no longer served by passenger trains. MM01 (formerly 4907, see Part 2) was also seen to be shunting the mill, while MM03 (former BHP Newcastle No. 51) was shutdown on an adjacent siding. We paused outside of town to record the passing of 8134N Westons Milling wheat service bound for Enfield behind the uninspiring looking 8130 in FreightCorp colours, and a gleaming X48 in pristine Pacific National paint, before continuing on to Parkes to first locate, and check into our motel. We soon found that Parkes is a very confusing town when you first drive in, with highways being renamed in town to street names, and plenty of “no right turn” signs, as well as plenty of occasions where the road we wanted to get to was on the other side of a footpath. Eventually we navigated the town, dumped our bags, and found ourselves baking in the heat at Goobang Junction, waiting for G515 to arrive from Goonumbla. While waiting for G515, we amused ourselves by watching former WAGR/Great Northern/CFCLA locomotives J103 and J102 shunting the SCT terminal. Painted in full SSR livery, the two J Class at Goobang Junction have an interesting history. Originally purchased by the Western Australian Government Railways (WAGR) in 1966 from Clyde Engineering for shunting duties (the J Class are almost identical to the first series Y Class purchased by the VR three years earlier). 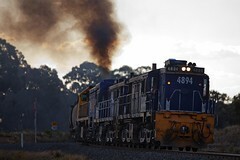 They spent their lives in WA until 1995, when four members of the class (the class leader had been scrapped two years earlier) were sold to Great Northern and transferred to Melbourne. During their time with Great Northern, the J Class were used on a variety of tasks, including shunting the National Rail Corporation freight terminal, running shunting turns and trip trains, and infrastructure work. 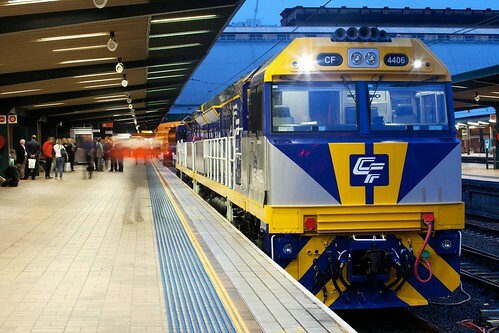 When Great Northern folded in 2002, ownership of the class passed to CFCL Australia, who leased the locomotives to Southern Shorthaul Railroad. CFCLA sold the four members of the class in 2009 and 2010 (to SCT and Freightlink respectivly) for use as shunters in NSW and SA. J103 and J102 can often be seen shunting the SCT freight depot at Goobang Junction. Sadly, the units did not get close enough to the accessible end of the shunting neck for a roster shot, and I was not to keen on tramping through long grass in late spring. I had to be content with shooting them across the field. G515 did arrive on cue at 1306 with 8242N loaded ore train from Goonumbla to Goulburn (the train runs to Port Kembla, but waits at Goulburn for its turn in the sidings, which are shared by the PN ore train from Blayney). After a break for lunch, we wandered around the station area. PN have a large depot at Parkes, and it is not uncommon for many trains to exchange crews or even loco’s when passing through. 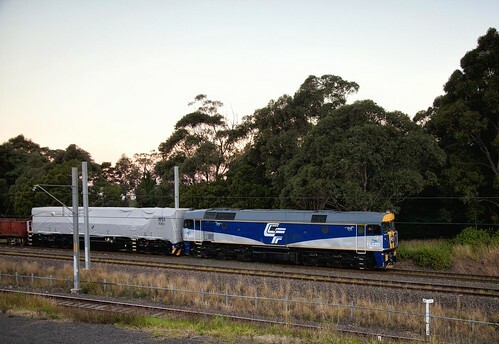 Quite a few locomotives were stabled in the yard, including former ATN Access L251, and a number of 48 class in various liveries, from GrainCorp and PN, to the battle scarred Freightcorp units, showing every day of their impressive age. 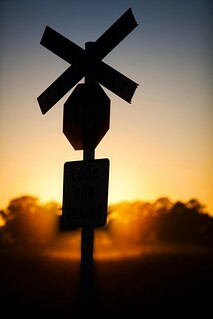 As the day began to slowly cool, we staked out the level crossing at Goonumbla to wait for one of the two trains that feed the mill at Manildra with grain from various silos in Western NSW. The first such train was 8832N coming towards Parkes from Narromine behind 4894, 4854 and X50, with X50 being a particularly long way from home! Since the cessation of bulk fuel transport by rail in NSW, most of the X Class have seen themselves redeployed on other bulk working, including grain, flour, cement and sugar traffic, among other loadings. After following 8832 halfway to Manildra, we decided that any further shots would endanger the possibility of the final shot of the day – a sunset shot of 7GP1 SCT superfreighter to Perth. We set up at Nelungaloo (to the west of Parkes) as the sun slowly slid behind the horizon, entertained by the harvesters busy harvesting a nearby wheat field. 7GP1 shattered the atmosphere when it screamed past at 1935 behind SCT Class locomotives 009 and 005. 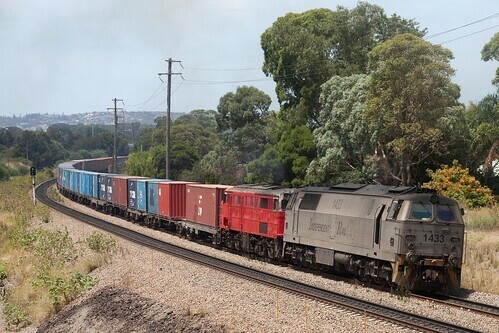 Up to 1800m in length, the train is a mixture of vans and double-stack container wagons, and the sight and speed of the train needs to be seen to be believed. What a fantastic way to finish! It was worth the massive dust cloud it kicked up that reduced both Todd and I to a sneezing, coughing, sniffling mess for the next few hours until medication (and a nightcap) brought sleep – a very welcome relief!